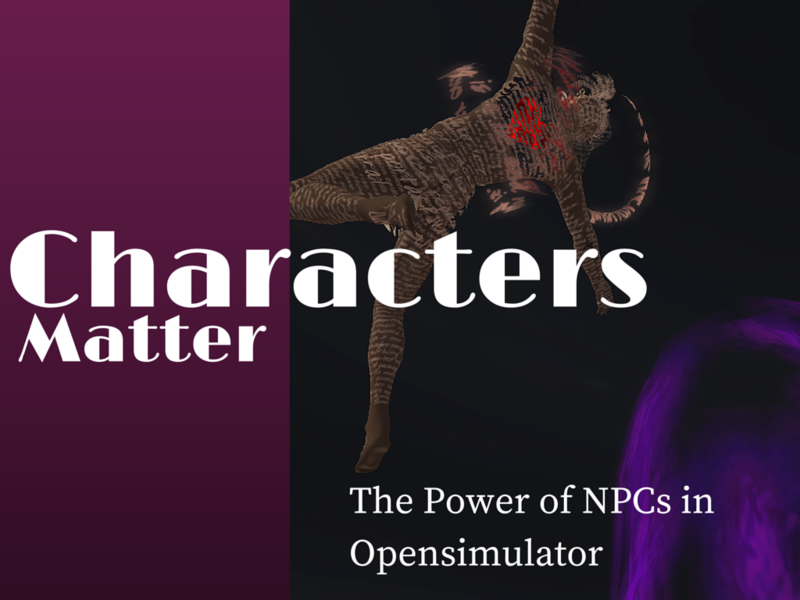 Nara's Nook Virtual Writer's Colony: Characters Matter:The Power of NPCs in Opensimulator. 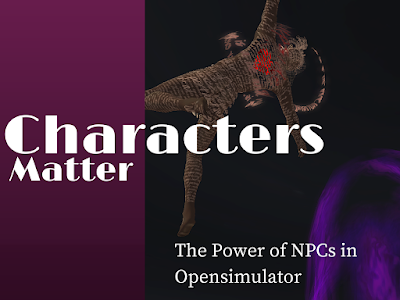 Characters Matter:The Power of NPCs in Opensimulator. It wasn't until I started preparing for this presentation and read some material Fred unearthed that I realized Non Player Characters, or bots as they are called in other virtual worlds, have traditionally been used to cheat in games, manipulate traffic through a region, or con people out of money. Perhaps that explains why some people aren't as thrilled as I am to see NPCs developed and promoted. My experience of NPCs is quite the opposite. 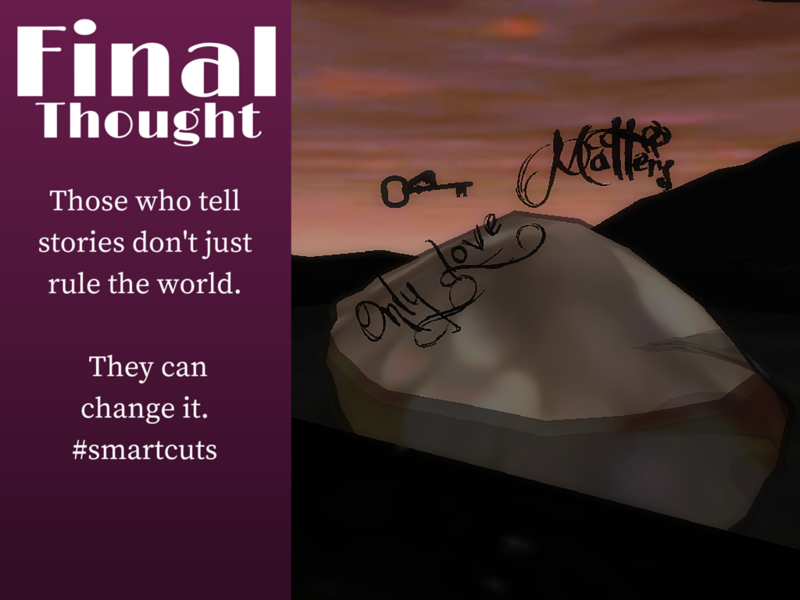 I see them as characters, personalities created by someone to entertain, to assist, and particularly from my perspective as an author--a storytelling tool. This is Rob, my first NPC. I used the Call Mom AI in a wristband he wore which made him my digital assistant. He could post reminders to my calendar, do internet searches, send texts and emails and while he wasn't helping me he could greet visitors to my regions and dance with them. If they were clever they could discover Rob had a storytelling feature hidden inside and chatting with him could unlock sections of the story. Like me, Fred Beckhusen has always seen NPCs as characters and helpers. He's particularly intrigued by the AI aspects and set me up with the AI we use for Lizzy, a rather unique and funny little chatbot we leave out to greet visitors to the Greyville Writer's Colony in Nara's Nook. You can visit Lizzy at world.narasnook.com:8900 I'll warn you now the conversation can wander into unexpected topics and Lizzy can get a bit fresh. I suggest you decline any invitations to tour her apartment. One criticism I hear of NPC's is that they are disturbing, empty, nothing there inside. Yes, they are simply scripted pixels, but any character from literature is to some degree just the author's scripted lines that reveal a personality. Charlie Brown isn't real. Scarlett O'Hara isn't real. Flo from the insurance commercials isn't real. They are empty of any thought but those inserted by the creator. They are words on a page in the same way an NPC is pixels on a page. But don't you feel like they are someone you know? Don't you get a sense of who the creator is through the experience of meeting their creation? That's because the personality and imagination of their creator is the DNA they are fashioned from. To illustrate my point lets have a little pop quiz. Over on the left side is the choice of creators. 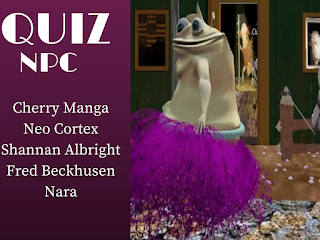 I'm going to run through these slides and see if you can tell me which was created by artist Cherry Manga, programmer Neo Cortex, romance author Shannan Albright, all around crazy creator Fred Beckhusen and which one I did. 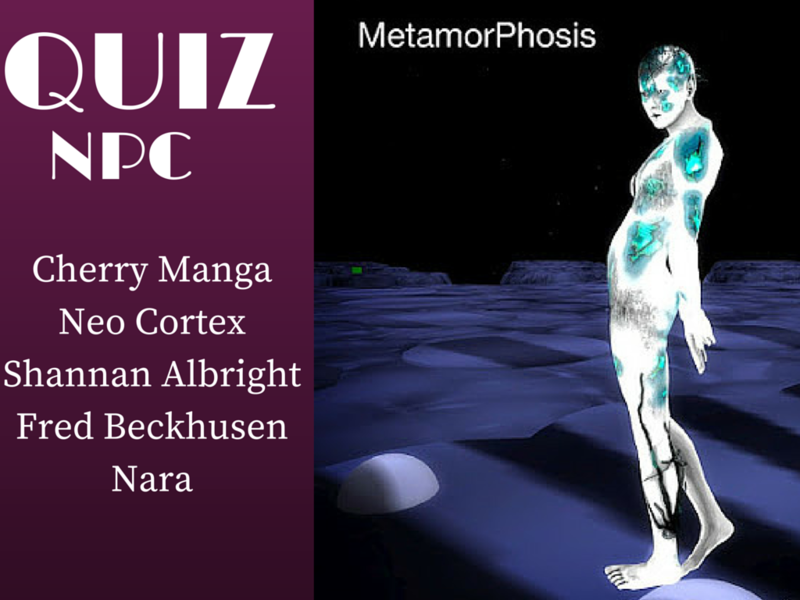 Without knowing very much about any of these characters you all rather quickly get a sense of the personality behind the creation. Because it is through the stories we tell each other, the worlds we build and the avatar characters we create that we all come to know each other. 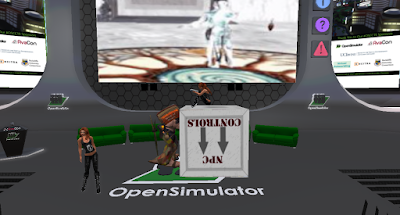 Fortunately, Opensim makes it incredibly easy for us to create characters. This is Shannan Albright as a two-week-old avatar creating her first NPC. You dress the way you want the character to look, click the poseball, and there you have an NPC. 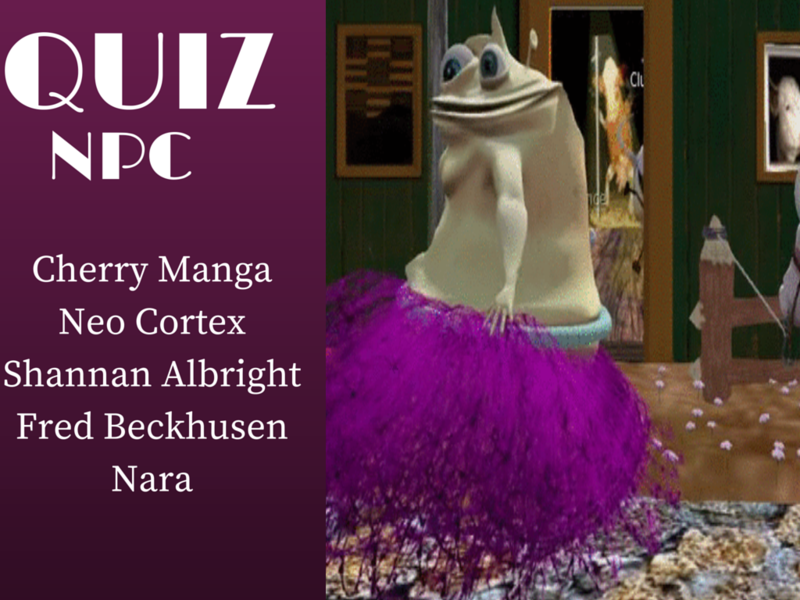 We give away these easy NPC kits with instructions at Nara's Nook. You can find one by the landing zone. You can also find one here at the conference in region Expo 3. 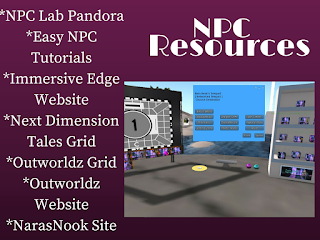 We have several freebies and some NPC there to entertain you. One of the kits contains something called PMAC which is like MLP only much simpler to use and NPC friendl. This screen I am using her runs on PMAC. I can rez animated characters and props from it. It strikes me as an excellent tool for teaching history or a variety of other subjects. Now it used to be a bit of a challenge to tell stories with NPC. 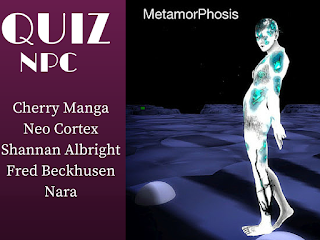 As part of our Hypergrid Story project Immersive Edge, we invited some of the best NPC scripters in Opensim to help us change that. Our NPC story sequencer is built on Fred Beckhusen's sequencer script and the All-in-One NPC script he has been working on for many years. Neo Cortex, Aine Caoimhe, and Fred Beckhusen added code on a weekly and sometimes daily basis to support some of features we needed in our story. What that gave us is a single script in a prim that can run an entire scene for a story. Add appearance notecards for the characters, any animations you want to use and write the actions and dialogues in a notecard called story, much like you might write a script for a movie. You never have to touch the script. A visitor collides with the prim, the story plays out and resets itself to wait for the next visitor. What you see here is a shapeshifter. Both of these pictures with mirrors are from Immersive Edge. It's a mirror scene at the end of the story. As part of our exploration of how an avatar changes who you are, we put these characters through a change at the end of every scene. They weren't always beautiful, not always human. The team for each scene chose who the characters would become next. 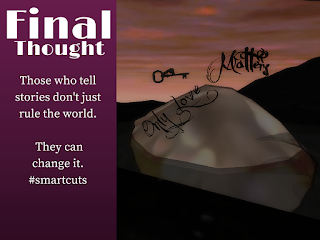 Here the avatars are about to return to the real world and they are having a conversation about their adventure. As they talk they shift through every avatar appearance they took on throughout the story. They have a conversation about how the changes impacted them. So think about this. We have two characters, each changing through nine different appearances, while they dance and talk. Those characters are mirrored in five mirrors which means we need an NPC couple behind each mirror and they have to change instantly with the pair in the center while they are dancing. This is all managed by one prim, with one script and the appearance cards for each NPC appearance. The NPC are rezzed, they sit on a PMAC powered prim. And the whole thing just works. Twelve NPC changing appearance, shifting shape, in sync, as they dance and talk. It's not complicated to do this. Our build from Last year's OSCC. We saved the oar and turned it into an NPC learning lab. There are islands in the sky. 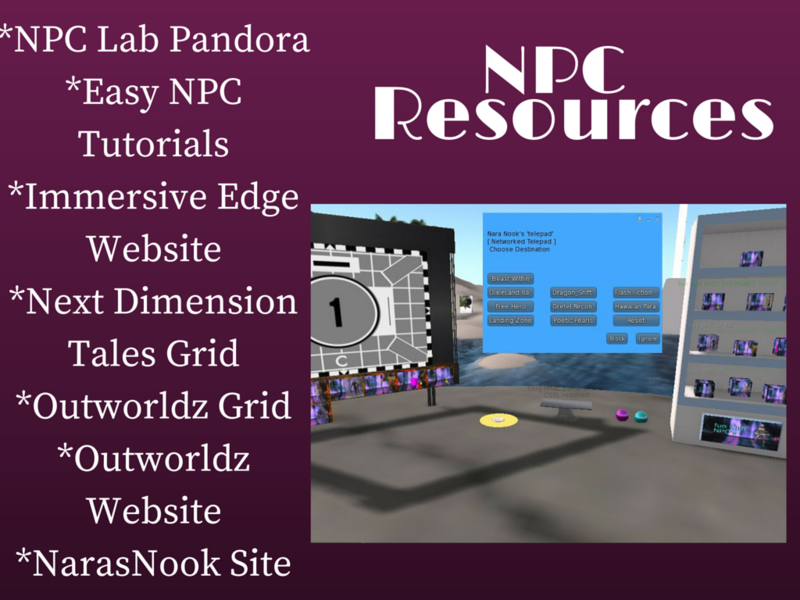 The teleporters will take you up to see any of the eight builds there demonstrating how to use NPCs to engage visitors to your worlds. These are the same tools Fred and Debbie use at Virunga to bring you their Gorillas in the Mist. They use them at Dragons to carry you into the beautiful fantasy world. They use them at Frankie to make you laugh until your sides hurt. 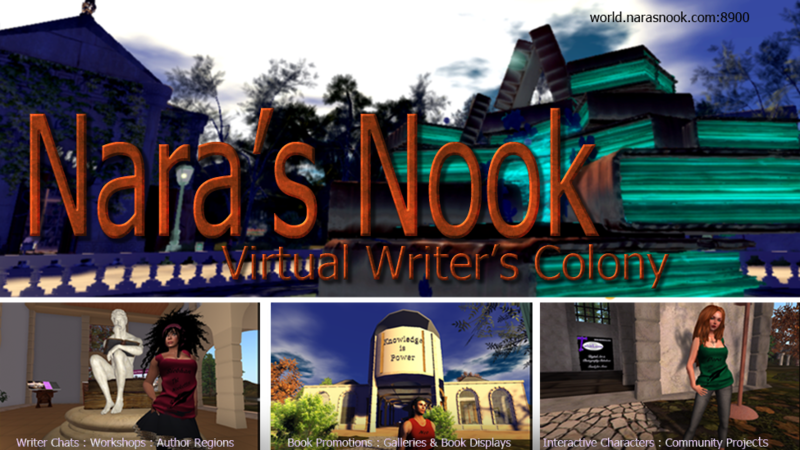 They are the tools we use to tell Hypergrid Stories and entertain visitors to the Nara's Nook. 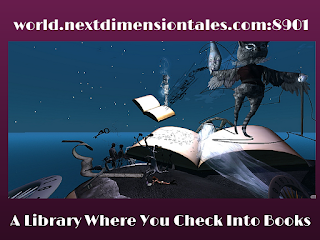 A library where you check into stories rather than check them out. That is the near future. 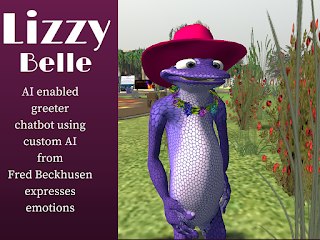 And I'm also hoping in the very near future we'll be able to click a link in an ebook that would launch a viewer and let the reader rez inworld in a default avatar. 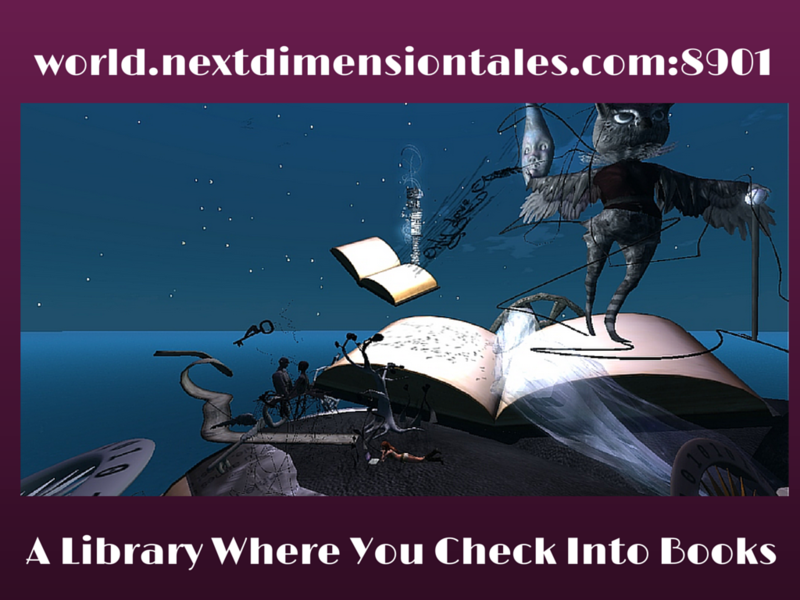 I would love to see readers move into virtual worlds from a story, or to have the ability to take someone from nonfiction instructions on how to do something, into a virtual setting with all the tools to practice accomplishing that task. I'd love to see history books take students into a time period, to have them meet historical figures. 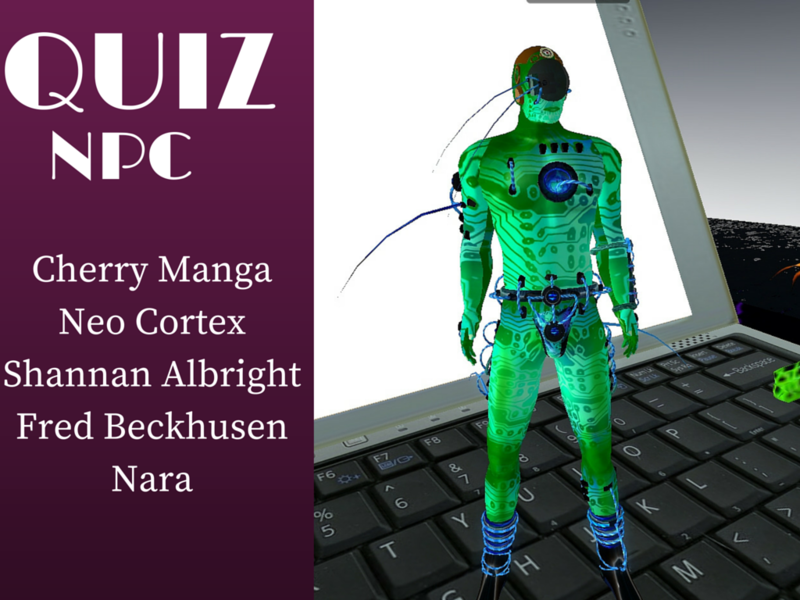 The ability to bring books and Opensimulator together will open a multitude of new uses. The only thing lacking is that working clickable link. So that part of Opensim's future is only a click away.